Just a quick example of why I like Plurk. I took this photo when I was trapped in stationary traffic on my morning commute. The whole package – rain, cones and queues – summed up what a great start to the day I was having. I think that’s pretty impressive – information-sharing and conversation parcelled up in about seven comments. 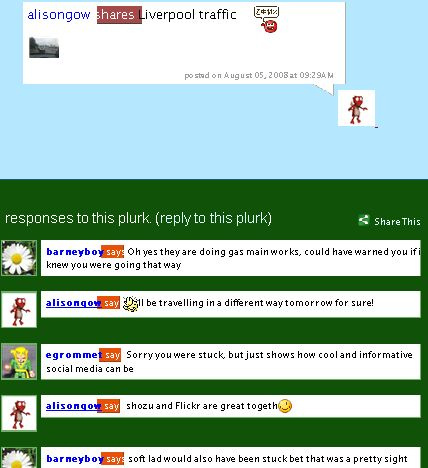 So that’s why, when people keep saying “I don’t get Plurk” I think they’re missing out. It’s different to Twitter but it’s definitely worth sticking with. Some threads attract 70-plus comments within less than an hour; I read over a hundred posts, plus uploaded photos, from an athlete plurking from the middle of a fairly large earthquake in Japan recently. It’s yet another way to source news and views online – and that can’t be bad. Why do they all have to have stupid names? I don’t know. Maybe xxnapoleonsolo or Captain Mac could tell them?